Fresh off a fourth-place showing at Royal Ascot, Miss Temple City will look to post her second consecutive graded stakes victory in the United States as she highlights an accomplished 10-horse field in the Grade 1, $500,000 Diana on Saturday, the first Grade 1 of the summer meet at Saratoga Race Course. The Diana, held over 1 1/8 miles on the mellon turf course, will be Miss Temple City's first start since the Group 2 Duke of Cambridge on June 15. The Graham Motion-trained bay filly will be looking to be the first 4-year-old to win the Diana since Winter Memories in 2012. Miss Temple City made history in her last stateside start when she beat a field of colts in the Grade 1, $300,000 Maker's 46 Mile on April 15 at Keeneland with a stretch-drive surge to become the first filly to win the race since its inception in 1989. The daughter of Temple City finished second in her Grade 1 debut, a head behind Her Emmynecy in the Queen Elizabeth II Challenge Cup on October 15 at Keeneland. She will leave Saturday from post 2 with Drayden Van Dyke in the irons. Mrs McDougal breezed five furlongs in 1:01.12 on Sunday at Belmont in her final work before the Diana. The bay filly, who came in third last out in the Grade 1 Just a Game, has shown an affinity for the Saratoga course after winning the 2015 Grade 2 Lake George. Mrs McDougal drew post 5 with jockey Joel Rosario aboard. “She's training well and I think she deserves another shot in a Grade 1,” said trainer Chad Brown of Mrs McDougal, one of his four Diana entrants. Dacita, who won the Grade 2 New York last out on June 16 at Belmont, also entered for Brown and won last year's Grade 2 Ballston Spa. In the New York, Dacita went from fifth in the stretch to a three-quarter length victory. She will leave from post 6 teamed with jockey Irad Ortiz Jr.
Wekeela, a French-bred 4-year-old, has finished second in her first two American starts since joining Brown's barn, which were both Grade 1 races. Wekeela was beaten by five lengths behind in the Jenny Wiley on April 16 at Keeneland before finishing just one-length behind Illuminant in the Gamely on May 30 at Belmont. She registered a Beyer Speed Figure of 98 in both races and will depart from post 4 with jockey Javier Castellano. Rainha Da Bateria will be looking for her first graded stakes win since the 2014 Grade 3 Jessamine. The 4-year-old from Ireland will be ridden by Julien Leparoux out of post 9. “With all my entries in this race, I'll let me jockeys place them where the horse is comfortable,” Brown said. Recepta, who finished three-quarters of a length ahead of Mrs McDougal for second in the Just a Game, will be making her first Saratoga start since her maiden-breaking victory in 2013 for trainer Jimmy Toner. Recepta will exit from post 7 under Hall of Famer John Velazquez. Strike Charmer, eighth in the Just a Game, has finished first or second in three of her last five starts and is seeking her first career Grade 1 victory. The 6-year-old has posted 90-plus Beyer Speed Figures in six of her last seven starts, including a career-high 100 in her victory in the Grade 3 Beaugay on May 14 at Belmont Park. Strike Charmer will be making her first graded stakes start at Saratoga and will leave from post 3 with Junior Alvarado in the saddle. Onus will be making her Grade 1 debut coming off a third-place finish in the listed Perfect Sting on July 2 at Belmont. Trained by Hall of Famer Shug McGaughey, Onus has one graded stakes victory to her credit with the Grade 3 Commonwealth Oaks on September 26 at Laurel Park. She will leave out of post 8 with Jose Ortiz in the irons. Isabella Sings, who along with Sandiva represents the Todd Pletcher entries, will break from the outside. The 4-year-old chestnut filly won the Grade 3 Eatontown last out on June 25 at Monmouth Park. Sandiva drew the rail with Manny Franco aboard. The Irish-bred 5-year-old has finished in the money in four straight starts and in eight of her last nine starts. The meet will mark the continuation of a great rivalry as Brown, the leading trainer on the New York Racing Association circuit in 2015, will be vying for the H. Allen Jerkens training title at Saratoga. Pletcher is the six-time defending champion and has 12 total titles. Brown is coming off his first Belmont spring-summer training title with 38 winners to Pletcher's 25. 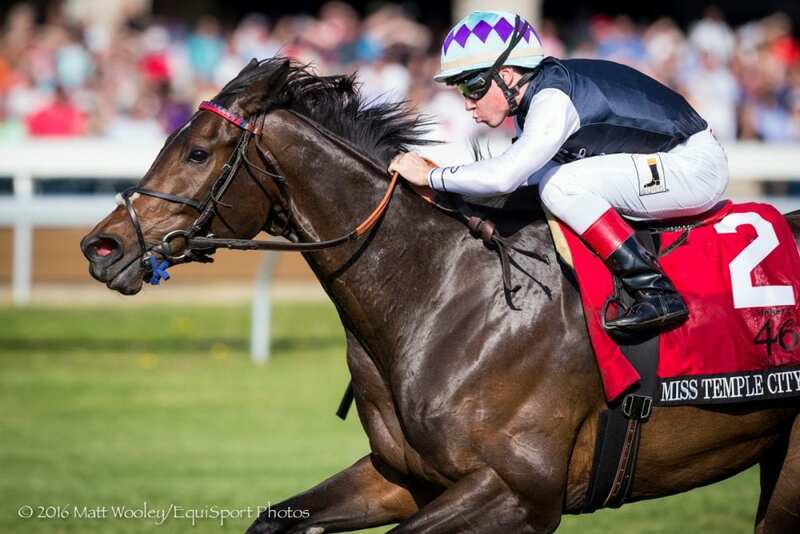 This entry was posted in Racing and tagged Diana Stakes, H. Graham Motion, Horse Racing, isabella sings, miss temple city, mrs. mcdougal, saratoga, thoroughbred by NYRA Press Office. Bookmark the permalink.